finished at last! Two weeks of hard work but it was worth it. I am happy with the completed panel, and now Bob will frame it for me. It was really a challenge to build a panel using all opaque glass. My usual method is to think about both sides as I work, and this time I concentrated on the top side only, completely disregarding the back of all the glass. You would think it would be easier, but it really wasn't. But when I held it up in the light, it was even more beautiful. we will frame this one to hang on a wall without backlighting. It is my homage to Vincent van Gogh's painting, with my own variations. Next I think I'll try one of his sunflower paintings - nice and bright and summery! I used a lot of Uroboros and Kokomo, and a few Spectrums. Lots of ring saw work because of the extreme textures and curvy lines. I welcome any questions or comments. Here's proof that I really have been working on this panel, when I'm not shoveling snow! It's about 3/4 done, as far as glass cutting and foiling. the overall size is about 18"h x 40"w.
Then on to soldering (you can see I have already tack soldered some of it), framing and the Big Flip, rinse and repeat. Bob is going to make a nice wooden frame for this one and we are going to design the hooks so that it will be a wall hanging, not a window panel. Pretty bizarro, huh? Vincent is turning over in his grave, with delight I hope. Blizzard over, no power outage this time. meanwhile back at the studio, doing many many tedious teeny pieces to depict the village and surrounding trees, and I will be so happy to get back to the sky, the fun part! I took a couple photos last night, but they turned out so blurry that I'm not going to publish. I will try again in the morning when I've got sunlight. I keep promising a photo, are you all beginning to doubt me? I don't blame you, but I promise that I am working diligently and that tomorrow you will see progress. one snowstorm done with, only a few inches to clean up this time but very heavy. still plugging away at the glass panel, with not much progress. hopefully by the end of today I will be able to post a photo that looks like something. weather says we are getting another blast, starting today and going into tomorrow. we are ready - stocked up on staples at the grocery store yesterday and Bob just got more diesel for the tractor. we lost power for about 5 hours during the Saturday blizzard, but thanks to NNEC we had heat and electricity back on before any catastrophes. I've taken the frozen stuff out of the frig in the garage and put on the deck; it's so cold that the frig isn't working properly but the outside air is keeping the stuff nice and frozen. enough snow talk, down to glass business. this panel is really a piece by piece project. I am working in three areas at once, trying to get a feel for the overall color scheme. I am using so many different colors and textures and hoping it will not get too confusing, but keep to the spirit of Vincent's painting. The stars are a huge pain - a center orb of bullseye sunflower yellow with two concentric bands of lighter yellow spectrum, for a total of 7 teeny pieces of glass... and you know the rule: the smaller the piece the more work it is. anyway, you can see for yourselves when I post the first photo. Another snowy day but at least there's sunshine. making progress on Starry Night #2, but not ready to post a photo yet. I am not following my usual procedure, breaking all rules, and it's terrifying. At Bob's urging, I am making this one with the thought of hanging it on a wall, not in a window, so I am strictly looking at the "primary" side and not even thinking of the back side or how light transfers. feels really weird and I don't know if I like it; my favorite part is trying to visualize the light transference. Here goes! I am so resistant to new technology; always drag myself into it kicking and screaming and full of angst... but at least I try. and it does seem that the geeks keep making it easier for us old fogies that were not born with a cell phone attached to our head and fingers that naturally text all the right buttons. Brief background: I am obsessed with stained glass. 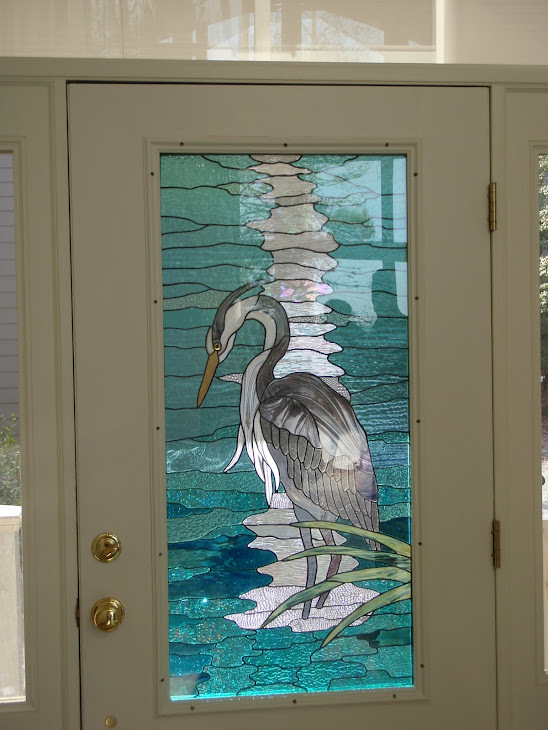 I have had a glass business for 20 years, and have been doing glass for over 25 years. I teach others how to do it, and occasionally have a student who gets as excited as I do over the medium, and continues on with it as an avocation or as a business. The more the merrier! 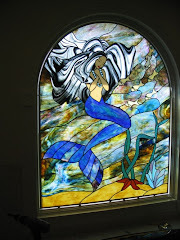 I have a website www.zekiahglass.com where I have photos of panels I have done and panels by my proud students. But I wanted a more fluid way to communicate my passion for glass, and a way to instantly publicize class panels, so here I am. Here on the Northern Neck of Virginia, in a very remote but lovely spot, I am working on an adaptation of van Gogh's Starry Night. I am using all opaques (a difficult task for me; transparents are more appealing to me) and it is quite a challenge. But amazingly I am finding lots of glass in my inventory that seems to work together. I'm not trying to copy the original painting exactly, but I want to capture his vivid colors and sheer intensity in glass. I'll publish photos as I go along. With the predicted blizzard, I have stocked up on groceries and just hope that the power doesn't go off - I need those grinders!! !